The latest addition to The Dolphin Viewer 3 is a client-side AO like in some other third party viewers. Does not use SIM script resources – less lag for you and others. Better performance, faster reaction time. No memory limitations – have as many animations as you want. Does not need an attachment point – even now with multiple attachments per point, there is still the limit of 38 attachments per avatar. Works in no-script areas (change animations, change animation set, turn on/off). Easier to change out animations in your AO since you do not have to rez an object and edit it. Note: From now on the Dolphin Viewer 3 will need a folder in your inventory, which will be automatically created when you first log in, and is named #DV3. While it is possible to delete it by logging in on an older Dolphin Viewer, it will be recreated next time you log in using the Dolphin Viewer 3. This folder method is the only way to store information on the asset server that does not require active cooperation from Linden Lab™ and is therefore indispensable for the client-side AO and further projects. To set up your normal AO in the client-side AO, you need to “unpack” it’s content. 1. Click the arrow on the right side of the “AO” button in the bottom tray. 4. Find the configuration notecard in the folder that you got from unpacking the content of the AO to use it as a reference. 5. Create your client-side AO set by clicking on the plus button (see image above) and give it the name of the animation set that you’re converting, for example “Vista Interesting Male”. 6. 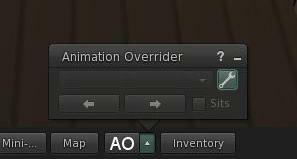 Once you name the animation set, you will see the AO categories, with the first one (“Standing”) visible. 7. Click on the arrow beside it, and you will open a drop-down menu with all the possible categories (click the image to enlarge it). 8. Fill the different categories in the AO floater with the animations listed in that category of the configuration card (if your AO uses the ZHAO scripts, the sections in the notecard have exactly the same names as the categories in the AO floater). 9. To do that, find the animations listed in one category in your inventory and then drag them onto the list on the AO setup floater. 10. Set the options for Cycling, Randomizing, and Cycling Time for each category. 11. Once you have configured all categories you want, click on the down-arrow in the bottom right corner of the AO setup floater to turn it into the small AO window again. If you simply want to import the whole AO you can drag&drop the configuration notecard from your inventory onto the AO floater. This works with ZHAO-II (Vista et al.) and Oracul AOs. If you are wearing any kind of attachment that uses AO-like functions, like for example a witches broom that makes you sit on it when you attach it, shoes with built-in ankle locking animation, or an attachable bicycle, take note that the client AO does not always work with those. It is better to use your inworld AO hud with these kind of attachments. These kind of things normally play their animations with a high prioriry to make sure they override any AO, but the client override still overrides them. The AO flyout window is not resizable in small mode. To resize it go back to setup mode. 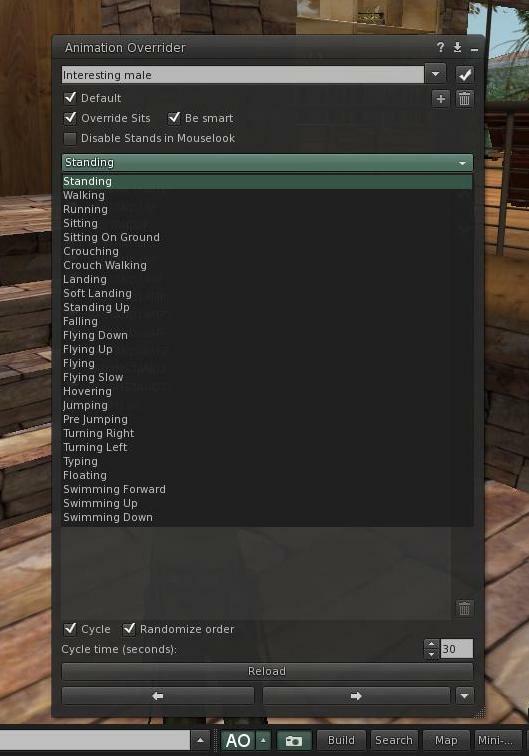 “Be smart” means that the AO will use the sit animations but not if some inworld object plays another animation on your avatar (as in, you’re sitting on a poseball). When set to cycle through animations but without randomizing the order, the animations are used in exactly the order they are listed in. 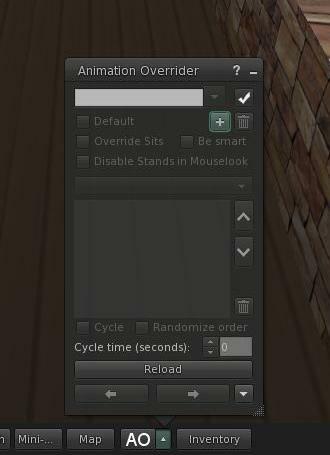 The animations can be reordered in the AO setup floater by using the up and down buttons to the right of the list. The left and right arrows in the AO flyout window change to the previous or next animation in the category that is currently applicable (“previous stand” / “next stand”).